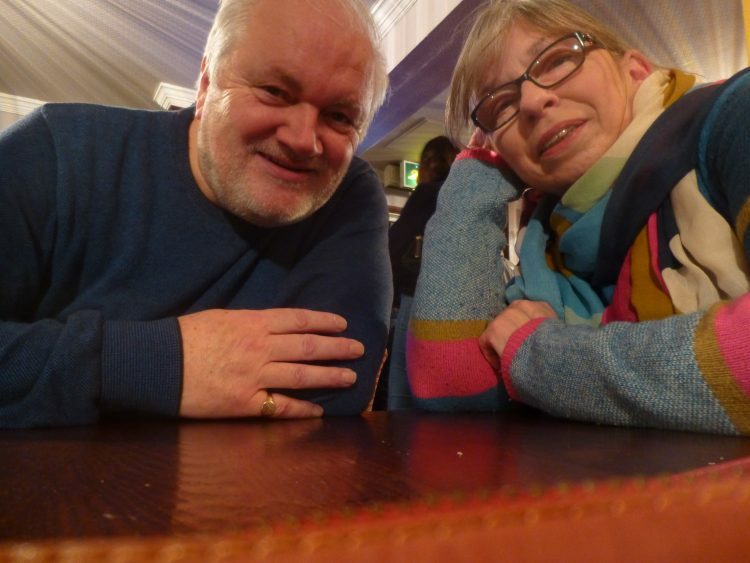 Here we are, Graham and me, seeing the New Year in last night! So now it’s time for new art plans for this year. I’m excited to share with you what I’m aiming to do in the next 12 months with my painting. Wrabness, Cattawade/Manningtree, Flatford, Dedham, Stratford St Mary, Higham, Nayland, Wissington, Bures, Sudbury, Long Melford and Clare. The paintings will all be either 36″ x 24″, or 18″ x 12″. Landlines: a new, intermittent series of paintings I am keen to start, which will all be focussed on lines in the landscape: hedges, walls, ditches, dykes, green lanes, roads, holloways, canals, railways, power lines, telegraph poles, crop lines, bridges . . . The Ridgeway: Having done 5 paintings from wonderful walks on The Ridgeway in 2016, I am planning to stay near the Uffington White Horse either in early May or early September. I will walk some of the trail going into Oxfordshire, and see what new paintings may result from that. Designing and ordering the books is a job for January, so I will be launching these at All Saint’s Arts Festival in May. Which leads me on to . . .
All Saint’s Arts Festival: I’ve posted about this new venture already, but we are very excited to be organising and running this new arts festival at All Saint’s Church in Maldon from 25th – 29th May. Drypoint: I want to experiment with drypoint printing this year! This last one, which I’m particularly excited about, is organised by a new friend I made in 2017, stained glass artist Naomi Brangwyn, and she has invited me to show with her. There will also be one or possibly two other artists showing with us.